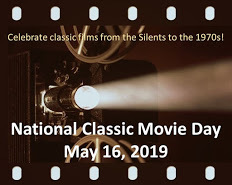 This post is part of a Book-to-Film Series hosted by the fabulous Lindsey at The Motion Pictures. The series runs until June 30. 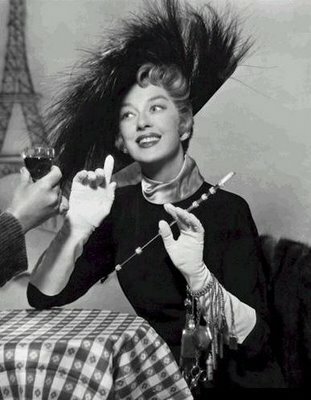 Rosalind Russell ends up sporting every bracelet in the Warner Bros. Props Department. It is hard to imagine a family relative more flamboyant than Rosalind Russell in the legendary 1958 comedy Auntie Mame. Briefly: Auntie Mame is about an orphaned boy (Jan Handzlik) who is shipped to Manhattan to live with his unconventional aunt, a lavish woman who wears bracelets up to there. Auntie Mame lives in a posh two-storey apartment and throws over-sized parties for artists, free-thinkers and world travellers. Who can out-shine, out-do, out-be Russell’s Auntie Mame? She re-models her apartment, her wardrobe and her hair with each new phase in her life. Look: She’s a Buddhist in silks; a dutiful Aunt in pastels; a poor working woman with buttoned-down collars; a southern belle in flouncy skirts; a wealthy bohemian swimming in accessories. And so on. It’s like a 1950’s issue of Vogue! Although she is the dominant personality in this movie, Russell doesn’t overshadow her supporting cast. There is a superb collection of characters in this film which, in the hands of less skilled writers, would be mere stereotypes (the obnoxious nouveau riche, the drunk Irish writer, the mean bank trustee). But these characters don’t feel like stereotypes. Each one is amusing and, in his or her own way, adds texture to the film. Now, if anyone overshadows Russell’s Auntie Mame it is the Original Auntie Mame, star of the novel by Patrick Dennis upon which the movie is based. Oh dear. Our goal was to make a legitimate book-to-movie comparison. But the normal rules of comparison do not apply to the Mames. Both are delightfully outrageous, yet both have a soft heart for those in need. You can enjoy Movie Auntie Mame because of Russell’s performance. But you also enjoy Original Auntie Mame because Dennis’ clever, breezy writing. Two terrific Mames in two terrific formats, and we love them both. Either Mame’s a winner! Auntie Mame: starring Rosalind Russell, Forrest Tucker, Coral Browne. Written by Betty Comden and Adoph Green. Directed by Morton DaCosta. Warner Brothers, Colour, 1958, 150 mins. Never read the book, but absolutely loved Russell’s turn as Auntie Mame. The book is really worth a read if you ever have the chance. Patrick Dennis is such a great writer. Good and very interseting review, I am a fan of old movies so I will try and get round to watching it. I will try and watch it when I can, you should check out my reviews I have reviewed quite a few old movies. I have never read the book, but I did see the movie last year and although I wasn’t excited about watching the movie, I ended up liking it quite a lot. It was way funnier than I thought it would be. Thanks for the post. Yes, the movie has quite a bit of charm, doesn’t it? Thanks for dropping by! What a coincidence! Right now, I’m reading a biography on Patrick Dennis called Uncle Mame. Although I need to upgrade my VHS copy to DVD, this is one of my favorite movies, and your review captures its ebullient spirit. By the way, have you read about the plans to remake this movie with Tilda Swinton as Auntie Mame? How are you enjoying the Uncle Mame book? It sounds pretty juicy! I didn’t know there are plans to remake this movie! I think Tilda Swinton would be FANTASTIC as Mame. The bio reveals a lot about Patrick Dennis through interviews with his family and friends, but Patrick Dennis’ reprinted writings are the highlight. His letters and notes show as much flair as his books. Hopefully, the Auntie Mame remake pans out because I look forward to seeing Tilda take on the role myself! Russell is fabulous as Auntie Mame! I can only wish I had an fun loving liberal Aunt like that when It’s one of my favorite Russell roles along with HIS GIRL FRIDAY and MY SISTER EILEEN. This is one of my favorite Rosalind Russell roles, and now you’ve made me want to read the book. Would it mean I was a bad person if I imagined Russell as the book’s heroine? Would it absolutely ruin my experience? I get the feeling from your review that the book and movie are fairly compatible, which is a rare occurrence, indeed! Thank your for your post! Hi Margaret, it would not ruin your experience if you imagined R. Russell as the book’s heroine…but don’t be surprised if that doesn’t stick for very long. I, too, pictured Russell but after a few chapters the “book” Auntie Mame became a different character. Let me know your thoughts if you do get the chance to read it. The book and movie are fabulous!! You are so right!! An amazing, larger-than-life character! It shows what a skilled writer Patrick Dennis was. Ruth, I’ve only read bits and pieces of Patrick Dennis’ memoirs, but I’ve seen both the marvelous 1958 film version and the less impressive 1974 version with the well-meaning but miscast Lucille Ball (to be fair, I enjoyed the musical numbers), and your review of both the book and the Rosalind Russell were great fun to read! My dear late mom had the privilege of seeing Angela Lansbury in the musical MAME on Broadway. Heck, Mom’s family nickname was “Auntie Mame,” on account of her own warm, wonderful, larger-than-life personality and beauty! To slightly paraphrase your title, Ruth, everyone’s a winner if they have an Auntie Mame-type in their lives — wonderful post!